Are you thinking about upgrading your property with stainless steel kitchen appliances? Good choice. A beautiful, modern kitchen is an amenity that renters crave, and adding stainless steel appliances is a smart choice that improves renter satisfaction, increases property value and makes properties stand out among the competition. You likely have a few questions, and you’re probably wondering what options are out there, how to clean stainless steel appliances, and whether or not upgrading to stainless steel is a smart investment for your property. Black stainless steel. It’s more than just the next big thing in kitchen design. 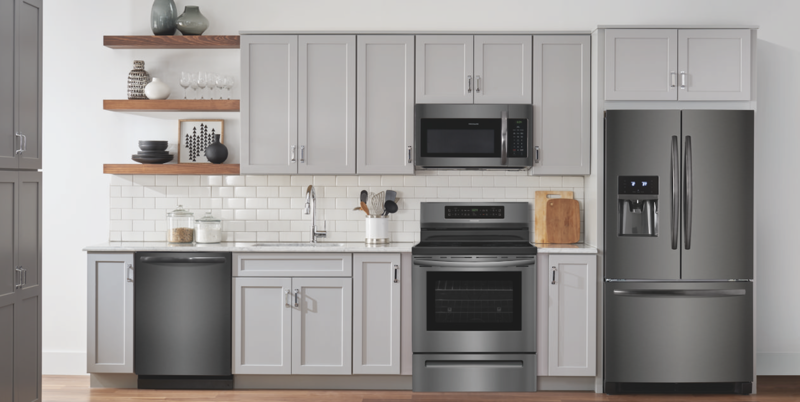 It’s a new spin on timeless, classic stainless steel appliances, and it’s here to stay. By their very nature, kitchen design trends are always changing. It can be hard to keep up, and nothing turns potential renters off faster than a tired, dated kitchen. In the multi-family housing industry, high-quality kitchen appliances are at the top of every renter’s wish list. Property owners often install stainless steel appliances to create a modern look with staying power – it won’t go out of style, and most renters will be pleased with an upgrade to stainless steel. Black stainless steel holds the same appeal, with a less industrial look. The 2017 U.S. Houzz Kitchen Trends Study placed black stainless steel appliances among the primary colors for kitchen renovations, and are gaining popularity across all age demographics. To learn more about stainless steel appliances, check out our helpful guide. It’s timeless. It’s durable. It’s affordable. It’s stainless steel. It is no secret that renovated apartments rent faster and can command higher rents. Upgrades to flooring, cabinetry, countertops or windows require construction, which can be difficult, expensive and timely. Upgrading appliances, however, is a quick but solid investment in your property.